With Andrei Vasilevskiy Out, What's Next for the Lightning? With Andrei Vasilevskiy Out, What’s Next for the Lightning? Tampa Bay Lightning goaltender Andrei Vasilevskiy underwent vascular surgery on Thursday, September 3 to remove a blood clot from the vicinity of his left collarbone and treat a type of Vascular Thoracic Outlet Syndrome according to an official report at the Lightning’s website. He’s expected to miss at least 2-3 months. The news came as a surprise as there was no indication of any ailment with Vasilevskiy prior to the announcement. In fact, there had been multiple reports surrounding his rigorous offseason training regimen and high expectations for the coming season. However, when Vasilevskiy arrived in Tampa earlier this week he had swelling in his upper left arm and was sent to have it checked, according to GM Steve Yzerman. I briefly touched on the fact that Vasilevskiy could see more time as the Lightning prepare for life after Ben Bishop due to cap constraints and the need to move him. With Steven Stamkos and Nikita Kucherov both in need of new deals next summer, it’s tough to imagine they can keep Bishop, a free agent after the 2016-17 season, at $5.95 million. 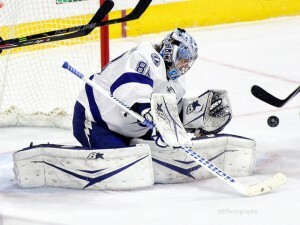 Especially with a stud goaltender such as Vasilevskiy waiting to take the reins. However, now his absence raises questions about how Tampa Bay’s backup situation will play out this season and means the Lightning may have no choice but to keep Bishop around for the foreseeable future. The Bolts have Kristers Gudlevskis and Adam Wilcox next in line. The consensus is that Wilcox will take over the starting job in Syracuse while Gudlevskis assumes the backup role in Tampa. However, I’m not sure that Gudlevskis is ready for that type of role. There are viable backups available via free agency such as Jonas Gustavsson but why would he want to sign with the Lightning knowing that Vasilevskiy will return somewhere around the season’s mid-point and he’d likely hit waivers? Joe Smith of the Tampa Bay Times reported that GM Steve Yzerman is looking at his young goaltenders to step up for the time being. He wants to see how they perform and also get a better idea of Vasilevskiy’s time table. While this is clearly a setback for the start of the season, it isn’t anything that the team can’t overcome. It could get tricky if Gudlevskis or Wilcox prove unable to handle the responsibility, as cap room is tight, but if they can fill the void for what will hopefully be a short period, the Lightning should be fine down the stretch. Things could also get interesting if Bishop has any setbacks from his groin injury that he suffered in the Stanley Cup Finals. Vasilevskiy had to relieve him during periods of that series and if Bishop aggravates it, the Lightning will be fully reliant on an unproven 23-year old Gudlevskis with a lot of question marks. One thing is for sure: the pressure is on Ben Bishop heading into 2015-16, due to his large cap hit and because Vasilevskiy proved to be a solid NHL goaltender when given his opportunities last season. With a cap crunch coming, Bishop will likely be discussed as a trade option among Tampa’s brass. Vasilevskiy’s unexpected health issue and surgery will take the pressure off Bishop early on, but if Vasy returns prior to the 2016 trade deadline and looks healthy, speculation could pick up again that Bishop might be on the move. The goaltender situation in Tampa will be something to keep a close eye on in the coming months.